Doug Webb of Robinson passed away suddenly, Saturday morning, December 23, 2017, at the age of 72. Visitation will be 6 to 8 p.m. Wednesday, Dec. 27, at Pecan Grove Funeral Home, 3124 Robinson Dr. Funeral services will be 1 p.m. Thursday, Dec. 28, 2017, at Pecan Grove Funeral Home Chapel with Rev. Aaron Zimmerman and Ronnie Stephens officiating. Interment with military honors will follow in Rosemound Cemetery. Mr. Webb was born September 19, 1945, in Crawford, Texas, the son of the late William Rueben and Billie Jane (Saulters) Webb and attended LaVaga High School. In June of 1966, he enlisted in the United States Army and served until his honorable discharge in April of 1968. On February 12, 1982, he married Donna Kay Webb in Waco. 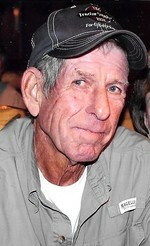 Much of his life was spent in the construction business, having owned and operated Webb Construction until his retirement in 2007. He enjoyed camping, fishing and hunting. It has been said “we lost one of the sweetest and funniest love of our life way too early.” He loved being retired and living life at his own pace. Being a hunter, he could hardly wait for deer season each year. In fact, this year he got an 8 pointer. He was literally a “happy camper”. The only bad thing was when the races were on television, he had to rush home early Sunday morning to see them, even though he was recording them. He loved his wife, Donna and all his family. By all who knew him, he will be greatly missed. Also preceding him in death was a sister, Sarah Nelson. Survivors include his wife of 35 years, Donna Webb; a son, Donnie Webb; a step-son, Sean Parsons and wife Anne; two brothers, Jimmy Webb, Larry Webb; four sisters, Carolyn Henry, Judy Puckett, Deleta Hefelfinger and husband Gene, Donna Taylor; three grandchildren, Josh Parsons and wife Jill, Shane Parsons, Erica Young; and great-grandchildren Alissa Young, Tristan Young, Dylan Parsons and Gregory Parsons. For those desiring, the family has suggested St. Albans Episcopal Church, 305 N. 30th Street, Waco, Texas 76710, for memorial contributions. Pallbearers will be Cody Myers, Drew Myers, Danny Saulters, Phillip Saulters, Weldon Webb, and Jeff Wollard.